At breakfast do you pass up the cereal for the pancakes? 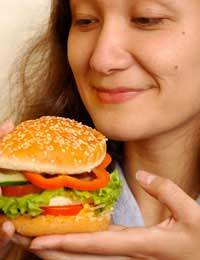 Do you eat fast food more than twice each week? When you start a pack of cookies do you keep going to the end? If you answer yes to these questions, you could be a junk food junky. Many nutritionists say that there is no such thing as bad food, only a bad diet. What this means is that it's okay to have an ice cream or a burger now and again, as long as they are incorporated into a healthy diet. It's not hard to keep your diet on the healthy track and make it tasty at the same time; all you need to do is make a few simple adjustments. Breakfast is the most important meal of the day. You should make time to sit down and eat a healthful one. A donut on the run is only going to give you a quick rush of energy that will run out just about the time you get to the office. A nutritious breakfast however, will get you through till lunch time. Whip yourself up a shake in the blender, with milk or yogurt and your favourite fruits, vanilla or honey. Cottage cheese with apple or pineapple pieces. Peanut butter and raisin sandwiches. A wholegrain bagel with fat free cream cheese or sour cream. The foods you eat can affect your concentration and memory skills. Foods rich in iron, including whole grains and beans, are excellent for improving mental performance. Though these are generally more difficult to absorb than animal sources, vitamin C will help enhance your intake, so you should consider including sources such as citrus fruits, strawberries, red peppers, broccoli, potatoes, watermelon, cantaloupe, cauliflower, and kiwis in your meal. There are two amino acids in the brain (L-tryptophan and L-tyrosine) which compete with each other to control brain function. Both these chemicals are essential to the processes of alertness, clear thinking and concentration. L-tyrosine production is stimulated by protein rich foods such as beans, nuts and soya. The brain uses L-tryptophan to synthesize the neurotransmitter serotonin, which is responsible for relaxation and satiety and slowing down reaction time. L-tryptophan production is stimulated by foods such as sunflower seeds, milk and carbohydrate rich food. Because these chemicals compete with each other, if you want to stay focused and alert throughout the day, then the best thing it to eat protein rich foods. That way L-tyrosine will reach the brain first, and will keep your mental performance at maximum potential.